Perfect for use in offices, factories, machine shops, garages and laboratories. Unique "Tension Frame" construction offers rigidity and strength without cross-bracing by interlocking heavy gauge channel frame members and steel legs. 1500 lb. payload capacity based on evenly distributed loads. Available in 2 top sizes and adjustable height ranges on 2" increments. Tough gray powder coat finish. Ships Class 70. FOB Shipping Point. Features 3/4" flake board with melamine plastic top. 2-1/4" semi-boxed steel apron. 30" standard height. Available in Walnut with Black edge and frame or Light Oak with Brown edge and frame -- Please specify. FOB Shipping Point. 3000 lb. 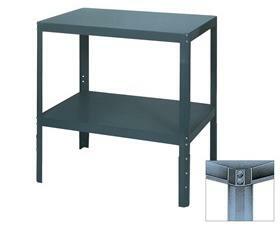 capacity shop stands feature heavy-duty welded frames of 1-1/2? 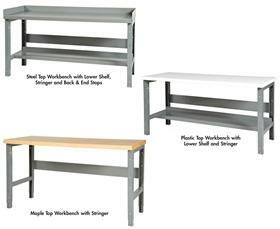 18 ga. tubular steel and a choice of industrial quality bench tops.&nbsp; Choose from 3 styles ? 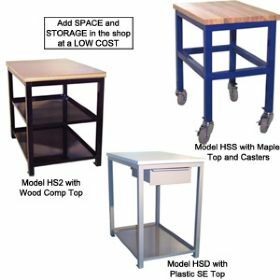 Standard (HSS), 2 Shelf (HS2) or Drawer &amp; Shelf (HSD) units.&nbsp; Each stand includes dual purpose floor pads that allow it to be secured permanently in place and inserts that will accept casters (sold separately).&nbsp; Steel color options: Beige, Black, Blue, Gray, and Red.&nbsp; 1-1/4? thick top choices are Wood Comp, Plastic SE and Maple.&nbsp; Laminate options: Almond, Gray and White Leather.&nbsp; Shop stands are available in 2 sizes and 3 heights.&nbsp; Custom sizes are available ? contact dealer for details.&nbsp; Make the stands mobile by adding a set of four 4? casters (2 swivel, 2 swivel/locking) which will mount on any model of shop stand.&nbsp; Casters will add 5-1/4? of overall height to the stand and reduce weight capacity to 1000 lbs. FOB Shipping Point. <P>An excellent performer for maintenance, repair or assembly work. Legs, stringers, shelves, backboards and end pieces are heavy duty 14 ga. construction. 12 ga. steel tops support heavy loads. Plastic tops are non-glare white and available as conductive (anti-static) at additional cost. Hard rock maple tops make a superior work surface. Gray in color.&nbsp; Legs adjust from 30-3/4" to 34-3/4".&nbsp; Channel legs available with glides for uneven floors. Shipped K.D. FOB Shipping Point.<BR><BR><STRONG>BENCH DRAWER<BR></STRONG><UL><LI><STRONG>Heavy-duty welded construction.</STRONG></LI></UL>Full extension drawer slides that allow easy operation with the heaviest loads. Multi-unit design allows for stacking drawers. Mounting kit&nbsp;included.&nbsp;&nbsp;FOB Shipping Point. 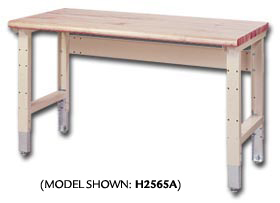 <P></P><P><STRONG>TOP SHELF</STRONG></P><P>Ideal for additional storage above the work surface.&nbsp; 10"D. x 12"H.&nbsp; Mounting hardware included.&nbsp; FOB Shipping Point.</P><P><BR><STRONG>CASTER KIT<UL><LI>Convert any workbench with lower shelves to a mobile workbench.</LI></UL></STRONG>Caster Kit includes heavy-duty 5" dia. casters (2 rigid, 2 swivel with brakes). FOB Shipping Point. Ideal for shipping/receiving, inspection, sorting, packing and more. Constructed with 13 ga. prime steel and a unique wing formed top channel.&nbsp;All structural components TIG welded for long term reliability. 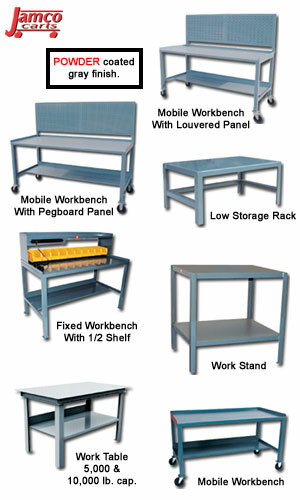 Select your choice of bench designs -- Basic Open, Closed Cabinet or Mobile. Select your choice of bench tops -Steel, Plastic Laminate, Resinwood or Maple and from over a dozen accessories to a build a high performance workstation. Bench Accessories fit all bench models. FOB Shipping Point. 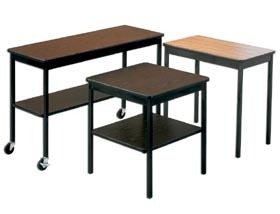 <BR><BR><STRONG>Basic Open Bench</STRONG> <STRONG>(pictured with accessories - ordered separately)</STRONG>&nbsp;- Open bench models include 2 straight legs, stringer and top. 30" overall height is available at the same price - add -30 suffix to Product No. See accessory (G) <STRONG><EM>Height Adjustment Channels </EM></STRONG>for further height adjustment. NEW: Open benches now available with flared legs for <STRONG>$6.95</STRONG> additional per&nbsp;leg <STRONG>($13.90 </STRONG>per bench) ...&nbsp;add <STRONG>-Flared</STRONG> to Product No. <BR><BR><B>Closed Cabinet Bench</B> - Same bench quality with added security of lockable sliding doors. Includes side and back panels with full depth bottom shelf. FOB Shipping Point. 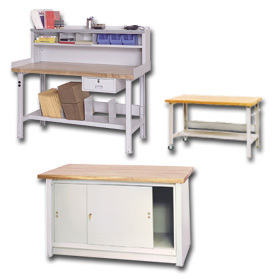 <BR><BR><B>Mobile Bench</B> - Adds 2 fixed casters and handle for flexibility in work space design. Includes 2 legs, stringer and bottom shelf for increased storage space. 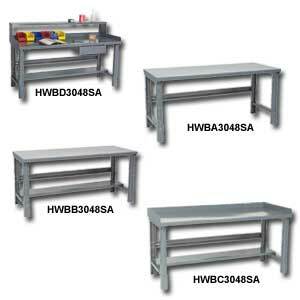 FOB Shipping Point.<BR><BR><B><I><U>Accessories for Benches:</U></B></I> <BR><BR><STRONG>B)&nbsp; Lower Shelf</STRONG> - Maximize your bench storage capacity. Your choice of 12"D. or 24"D. --for 36"D. benches only. Dividers are easily added for storage organization. FOB Shipping Point. 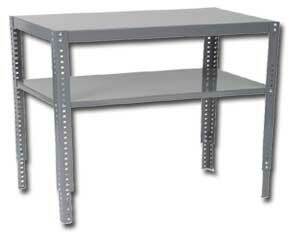 <BR><BR><B>C)&nbsp; Risers</B> - Extension units add 10-1/2" deep overhead storage space. Available in 12", 18", or 24" heights. Add back panels, intermediate shelves and other accessories to increase usefulness. Top shelf is punched on 3" centers. Dividers are easily added for storage compartments. FOB Shipping Point. <BR><B><BR>D)&nbsp; Riser Back Panels</B> - Combine back panels with back &amp; end stops to make an enclosed work space. Match with riser height and width. FOB Shipping Point. <B><BR><BR>E)&nbsp; Intermediate Riser Shelf</B> - Additional above counter storage shelf allowing a clean, organized work area. Shelves are punched on 3" centers. Dividers are easily added for storage compartments.Match bench width when ordering. FOB Shipping Point. 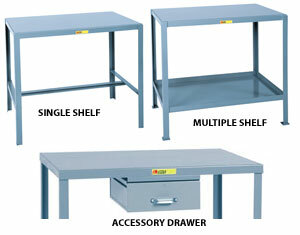 <B><BR><BR>F)&nbsp; Bench Drawers</B> - Handy, secure storage for your valuable items. Offered in economy and premium models. Premium features easy glide rollers. 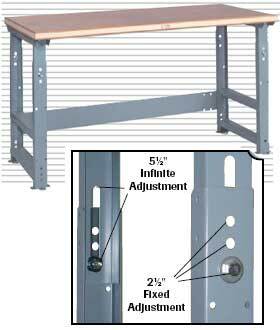 Please order mounting kit for steel top benches only. All other benches mount without kit. FOB Shipping Point. <BR><BR><B>G)&nbsp; Height Adjustment Channels</B> - Add up to 3" in height, in 1" increments for an optimized working level. Channels fit inside bench legs. Available with glide levelers for stabilization and caster mounting plate for mobile bench models. <BR><BR><B>H)&nbsp; Back &amp; End Stops</B> - Stops 4-1/2"H. keep tools, parts and other loose items contained. Match bench width and depth when ordering. FOB Shipping Point. <B><BR><BR>I)&nbsp; Dividers</B> - Organizational accessory for riser and lower shelves. FOB Shipping Point. <BR><BR><B>J &amp; K)&nbsp; Electrical Outlets</B> - Your choice of plugmold outlet strip or leg-fitted outlet with back cover. <BR><BR><B>Fluorescent Task Light</B> - Direct bench lighting for precision workmanship. Mounts under top riser shelf. Match bench width when ordering. FOB Shipping Point.